I was speaking to a chap at a race meeting yesterday and he remarked about a data sheet from Yamaha about jetting/barametric pressure/air temp. Does anybody know of this sheet and if they have one particuarly suited to an H, I would be most interested in a copy. 3D CAD master of DesignCAD, TurboCAD Pro and SolidWorks. Former TZ and TA rider. 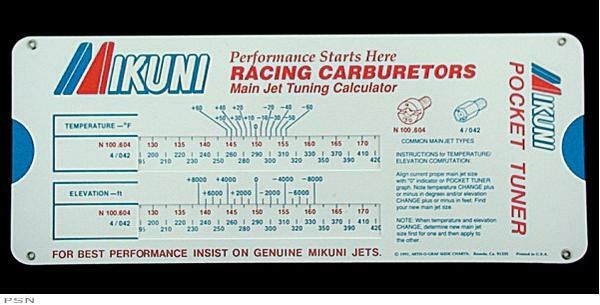 Not sure about a Yamaha one, but there a great one from Mikuni (or Sudco mikuni) like a big slide rule. It won't help you find the baseline, but it will help you keep relativity to it, once you do, accounting for those factors. Hi, get yourself a DTEC Relative Air Density reader. A small $$$ outlay that will give you Pressure-Humidity-Temp in a single RAD figure. You just need to get a base figure with a good plug colour running well and checked for at least 10 seconds, more if possible. Then adjust your jetting by the difference in % richer or leaner the DTEC is telling you to keep it spot on. It will tell you things you'd swear should be richer when its not and vice versa. Even from morning practice to midday racing. Get one. It's a PC program only though - USB. An Exhaust temp reader is also very good to see impending doom but the DTEC is also a good tool. This what I was talking about. I had to find Kerry's one to get the name from it. Pretty basic. Good but basic, allows for both temp and elevation - you add the changes together essentially. Not as slick as doing the full RAD thing and may not be as granular.